armpower.net: Alex, what do you think about the upcoming Vendetta All Stars - Armfight # 50? Alex Kurdecha: I think this will be the main event in the world of arm-wrestling in 2018! It will be a mega show which everyone has been waiting for! This is worth seeing! I am happy to be a part of this festival of strength and will! armpower.net: What do you think about your opponent? What would you tell him? A.K. : Scot Mendelssohn is a great name in the history of sports and a bench press legend, he has broken 60 world records during his career. He also held the all-time world record in the raw bench press, regardless of weight class with 715 lb (324 kg) for 8 years. This man needs no introduction in the world of powerlifting. He is extremely strong and is going to use this strength at the armwrestling table. A Big Battle is coming! I've heard the name of Scot Mendelson from the time I started training in the gym! Scot is the Legend of Powerlifting! This man has incredible power and will of the champion! I respect him and I'm glad that I have the opportunity to stand with him at the same table! Scot progresses in arm-wrestling, develops both strength and technique: at the “Arnold Classic” tournament he fought with Michael Todd almost on par and it says a lot! I wish Scot to feel the incredible spirit of arm wrestling in the upcoming Vendetta! armpower.net: Alex, what do you think about the 6-round format of matches - Armfight? A.K. : This is a professional format that allows an athlete to show all his best strength and will characteristics. In the 6-round duel, endurance and psychological struggle play a big role. This is a struggle of the body strength and the spirit strength! 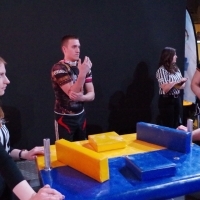 This is also a very rich format, which shows armwrestling as an interesting and entertaining sport. armpower.net: Alex, thank you for the interview and good luck in preparing for the Armfight#50! Devon Larratt: I always push my hardest. Malin Kleinsmith on preparation for Vendetta and importance of a team. Andrei Pushkar about idols in arm-wrestling and generally in sports. Dmitry Silayev - potential winner of the World Cup "Zloty Tur" 2018?